The Open 60s are in Les Sables d’Olonne undergoing final tuning for the Vendee Globe. I remember one day, in my early teens, sailing Falcon solo out of Fowey, around the Cannis Buoy off Gribben Head and back again – all of three miles. A big adventure for me. So . . . tuning – improving performance on the water. The general equation is: hull – tiller – person – sheets – sails (with some fiddly bits in between – or a lot of very sophisticated fiddly bits on an Open 60). Start with tuning the person. Well, this one learns a lot writing about sailing, learns more reading about it, but never learns as much as when he’s out there doing it – and he needs to take more exercise. 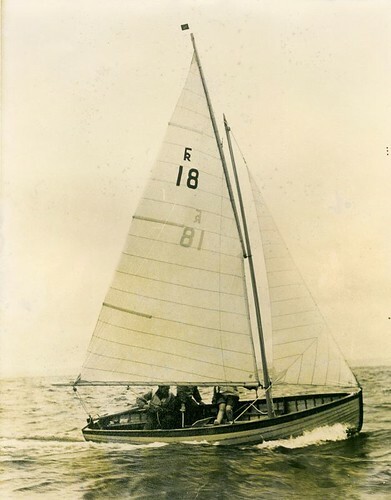 Looking at the picture of Falcon, I remember Dad being very critical of it – he didn’t like the way we’d set the mainsail and spent some time working on it – adjusting and readjusting the set until he got it right. I now realise how much the picture affected him. He became very particular about setting that sail. I guess he used pictures to critique the boat and then . . . . oh, good grief! I’m turning into my dad!